When little becomes big – Avoiding the headache. It’s disconcerting to realize your plants are bigger. A lot bigger. When a tree or shrub finally grips the earth with a committed heart and gets down to the business of seriously growing, the gardener can instinctively feel the change. And it’s frightening. 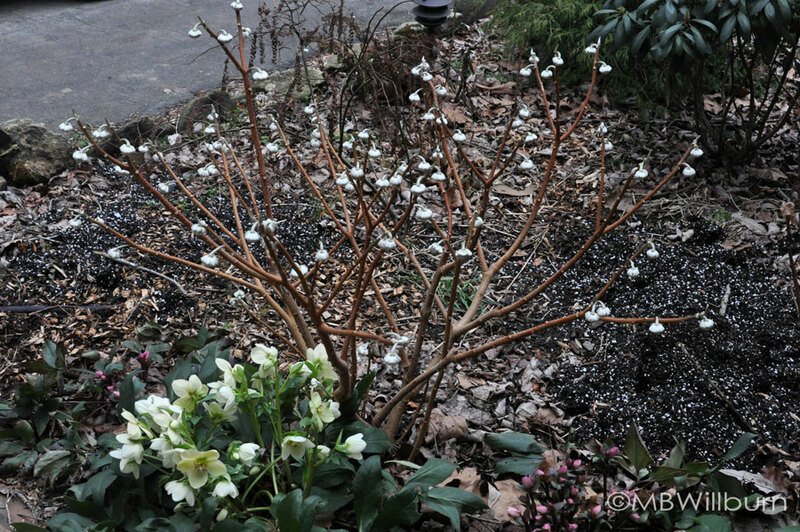 This Edgeworthia chrysantha doesn’t look like much its second year in the ground, but once I’d determined this zone marginal shrub would live without babysitting, it got a new forever home further from the pathway. Suddenly the two foot Japanese maple that made do with a respectable six inches of growth each year is putting on 18 inches in all directions and shows no signs of stopping. The ‘clumping’ bamboo that rested in place for fifteen years is exploring its spreading genes. The philadelphus everyone told you would be a menace is suddenly…a menace. And thankfully it did get moved. Four years on and it’s 5 feet tall and wide. It will be 8-10 before its all over. It’s puberty for plants and if you didn’t plant with this in mind (how many of us have babies to gain teenagers? ), you may feel a little out of control. Of course, you may have been one of the rare gardeners who planted with terminal size in mind (I’m told they exist). All you must do at this point is lop a limb or two and enjoy the vigor and glory that is Nature set free. But I’m not addressing the clever crowd today. Instead I address my remarks to those led down the garden path by desire, by marketers, by friends, and by impulse purchases. How many huge shrubs and trees are finally dug up (at great physical cost) and destroyed every day during the gardening season across America I wonder? It’s more than just Leylands that get out of hand – even a rose in the wrong place is a headache throughout the year. So, what can you do to prevent tragedy in your landscape? How can you run with the clever crowd from here on out? 1) Research your plants. I’m afraid this isn’t as easy as looking at the tag. I just helped a friend buy a Japanese maple yesterday at a Big Box whose pants-on-fire tag claimed a terminal height of 15 feet. It’s more like 25, possibly 30 – but in this case, that’s exactly what she needed. The poor shopper in a tiny yard looking for a small tree – not so much. Researching means checking trusted sources such as Dirr’s Encyclopedia of Trees & Shrubs or speaking to a trusted Independent Garden Center. Then it means going online to check large garden chat sites where everyone can’t wait to tell their horror story of the 30 foot Japanese maple that swallowed their garage. Believe them. 2) Once you’ve got a better idea of what you’ll be eventually be dealing with, use poles the same size in the landscape (I use bamboo) to see where shade will be cast, where views will be blocked or pathways lost. Don’t forget width. It’s very difficult to just imagine them large – give yourself a template. b) Commit yourself to moving said shrub or tree within the next three years. In order for this little montage to keep working, the lemon thread chamaecyparis must be routinely pruned. But then, the ostrich ferns must be routinely pulled. It’s all dependent on how much work you’re willing to do. Pruning is not always an answer – there may come a time when the natural shape of the Chammy is ruined by all that choppy choppy…. Though (b) is an option and I provide it here as such, it isn’t the better option. Shrubs and trees take at least a year to get settled, and when you move them, it sets them back (not to mention how tough it is to move a tree that has finally put its feet down). 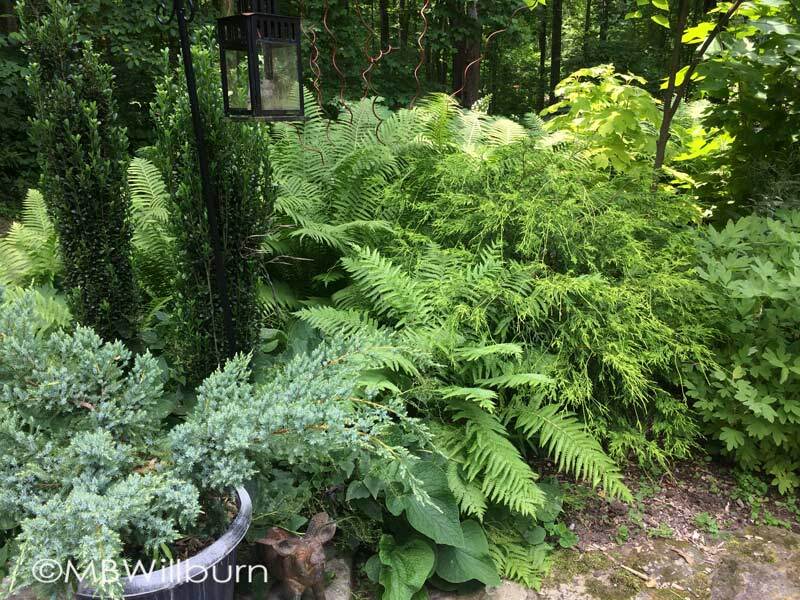 I encourage moving plants and trees when you’ve made a design mistake and need to change it, or if you’re putting something in a nursery holding bed; but planting something knowing you’re going to move it is torture for yourself and the plant. 4) Lastly, and assuming you were exceptionally disciplined and chose option (a) above, keep a sharp eye on your small specimen and make sure it isn’t swallowed up in the landscape as it becomes the plant you want it to be. 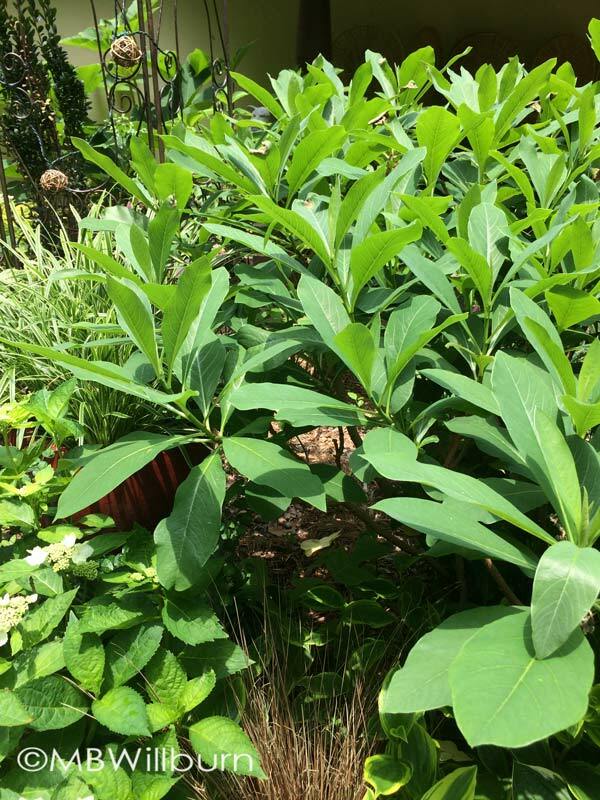 Shade cast from other plants can completely change the vigor and shape of a tree or shrub – keep your eyes open and your beds free of crazy weeds and aggressive perennials. 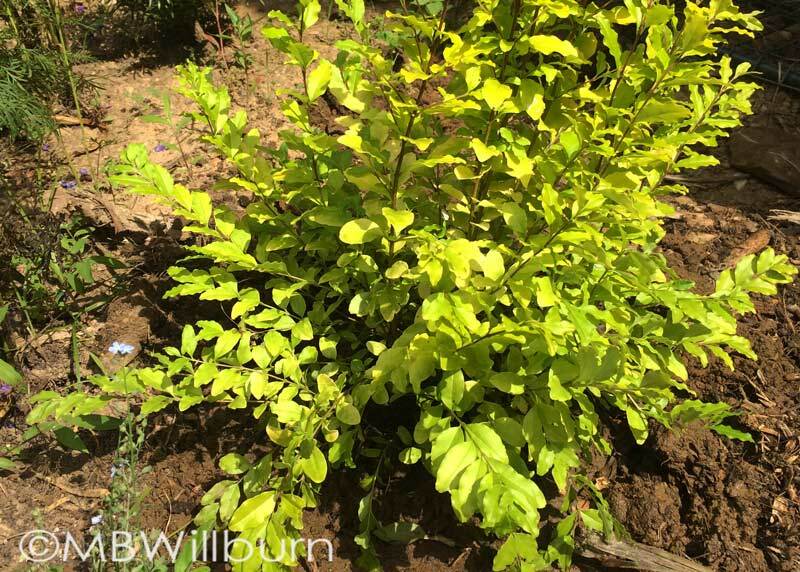 Placing a small shrub in a nursery bed for holding while you figure out the how, where and when is a great idea. This ‘Sunshine’ ligustrum from Southern Living Plant Collection has almost tripled in size while it’s been waiting. Time for a better home. As I said in the beginning, it’s a bit disconcerting when the real growth starts, but taking time to plant wisely can save you a lot of blood, sweat and tears AND allow you to sit back and watch a garden mature with the knowledge that everything is going as planned. Love this post! I’m chopping out lilacs now. In Colorado’s high country, things are either invasive or dead! Good point about the tags at the store not always being right.